In celebration of Pi Day (3/14) photo library site Shutterstock took a dip into their library to glean some delicious pie pics. 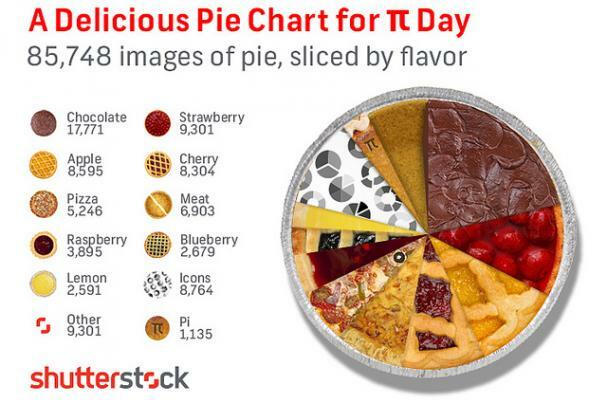 They ended up with this tasty infographic revealing the flavor breakdown of the 85,748 “pie” search results from their image library. Yes, we know that “Pi” equals 3.14159… and not “Pie,” but we couldn’t resist the delicious comparison! Any way you slice it, this is some tasty data! Check out some more flavorful (or at least interesting) numbers that didn’t quite make the chart here on Shutterstock.